Sparta and Argos were quarreling over Thyreatis, a territory which was occupied by Sparta, but belonged to Argos. The Argives marched out to recover their land, but instead of engaging in battle, the two armies agreed that rather than commit full armies, 300 of the best men from each side would fight it out to determine a victor. After a bloody contest, only three men remained, two Argives and one Spartan. The Argives claimed victory because of their numerical superiority and returned to their army. The Spartan also claimed victory, since their man was the last on the battlefield. The Argives sent their entire Hoplite army forward to settle the argument. An equally determined Spartan army met them. After heavy losses on both sides, the Spartans emerged victorious. • Five Spartan units are special five bronze block MH units. 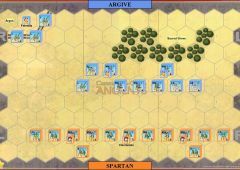 • Battle of Champions – Each side takes 8 unused medium Hoplite infantry blocks to represent its 300 champions (light blue MH blocks for the Argive army and bronze Spartan MH blocks for the Spartan Army). 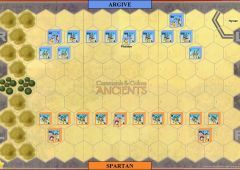 The champions will fight it out before the start of the battle by being lined up facing each other along two adjacent horizontal rows of hexes between the two armies. Both players roll 2 battle dice at the same time. When a blue symbol or sword is rolled, one enemy block is eliminated. Also, when a player rolls two flags, one opponent’s champion is disgraced and is eliminated. It is possible that both players may lose one or two blocks during any combat roll. Die rolling continues until one side is at two or fewer blocks. Then the fight of champions ends. 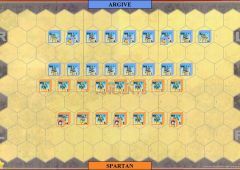 Any remaining blocks are added back to the Hoplite units in each player’s army, with a maximum of one block added to a unit. 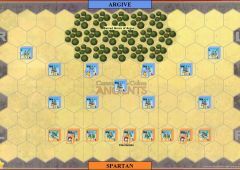 Some Spartan MH may begin the battle with six blocks, and some Argive MH units with five blocks. The maximum die roll for any MH unit remains four dice. The main battle will then begin. • The side that has the most remaining champion blocks will Move First . If a tie, the Spartan Army moves first. Seems that the Spartan blocks give their side a good amount of advantage.